← Weeks 9, 10, 11 – Watersheds, field work, and MUTINY! Before I explain my problem-based lesson that I gave on Friday, I feel it is necessary to explain why I wanted to give this particular lesson. Throughout this seminar we have talked about some misconceptions that students have and how when teaching it is important to consider that the students are not a blank slate. In other words, their learning will be affected by the misconceptions that they have. Well, I discovered one of these misconceptions recently that is related to my field of research. I’m certain the students could go on and live their lives just fine without accurate knowledge of this concept, just like students can function in society without knowledge of what causes the phases of the moon, but I wanted to at least try to stop this misconception from forming, especially because I grew up with it as well. So what is this misconception? First I think I’ll ask whoever is reading this blog: what are tissues made out of? If you’re only thinking cells, you are only partially correct. I remember learning a lot about cells growing up. I also remember learning cells make up tissues, tissues make up organs, and organs make up organ systems, and I remember most of the focus was on cells, organs, and organ systems. But one thing I don’t remember learning about is tissues. Does this mean I was taught something wrong? No, absolutely not. I actually had very good science teachers; they were so good in fact that they helped inspire me to pursue science. Why then did I develop this misconception? I believe I developed this misconception because of what I wasn’t taught, and because I wasn’t taught that information, I used what I knew to create a false model of what tissues were made out of. The misconception I developed is that tissues are made out of only cells. I remember imagining just a bunch of cells stacked in some sort of ordered fashion, and that somehow that arrangement and the different types of cells in the tissues must be what gave tissues their different properties. This model worked fine until later in life when I started asking myself some questions that couldn’t be explained by this model. Once I discovered there was more to tissues than just cells, I felt so dumb. I couldn’t believe I ever thought such a thing and I thought I just missed something in school. After having several interactions with young students (through teaching in junior high and high school programs here at KU), I have found that most of these students have the same misconception that I had. It’s possible that I did learn what tissues are made out of, but it might have been too late because I already established my model of how they worked, and my learning reverted back to my previously established model (which is something else we discussed in seminar). However, I’m not so sure I was ever taught the information. I looked at one of the 6th grade science curriculums (of which I assume are a result of the current science standards) and there was no mention of tissues other than cells make up tissues. It makes sense to me that if students are told that cells make up tissues, and they are never told what else makes up tissues, that they would start to believe that cells are the only component to tissues. The students in Ms. Scali’s 6th grade class are just now at the point where they are being introduced to the cells, tissues, organs, and organ systems model. They just learned about cells, so I thought this would be the perfect opportunity to do a lesson on tissues to try to stop this misconception from occurring. The main part of the lesson was for them to explain to me what was causing a phenomenon in skin tissue. I cut a small circular hole in some skin tissue (and yes, I did actually bring in some chicken skin), and I asked them what they thought would happen if I pulled on either side of the hole (horizontally). The students all thought the circle would stretch forming an elliptical shape. I then asked what shape the circle would form if I pulled above and below the circle. They assumed again the hole would form an ellipse. Well, stretching on either side of the circle did alter the circle’s shape into an ellipse, but in the other direction, the circle remained a circle. To me, this phenomenon doesn’t make sense if you’re established knowledge model of tissues is that tissues are only composed of cells. I then gave each student a newspaper and the students were able to establish that the newspaper had a similar phenomenon. I had to kind of spoon feed them to get them to investigate the newspaper further to discover why the newspaper behaved the way it did but eventually, it seemed like most of the students came to the conclusion that the newspaper had fibers in it and the fibers were oriented in a certain direction, and that explained the newspaper phenomenon. Then the fun part was seeing some of the students make the connection that skin must have fibers too. I then talked a little bit about where these fibers were located (in something we call the extracellular matrix) and I briefly introduced Tissue Engineering and that knowledge of the entire tissue (not just cells) was very important because the extracellular matrix can play a very important role in the overall function of the tissue. 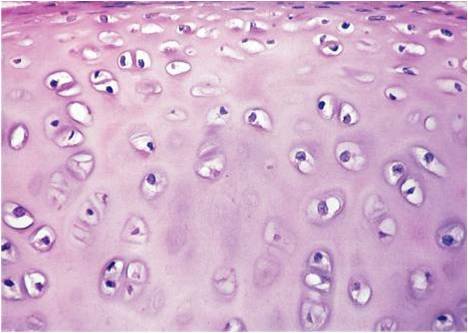 I even showed them a photograph of some cartilage tissue (see below), where the students could clearly see that cells were only a part of the entire tissue. Now, I realize this isn’t really a problem-based lesson. Ok, well we did solve a problem, but we solved it together. This is why the next Friday I come we will be having the problem-based lesson part 2, where the students will work in groups to come up with a tissue engineering design. Stay tuned!